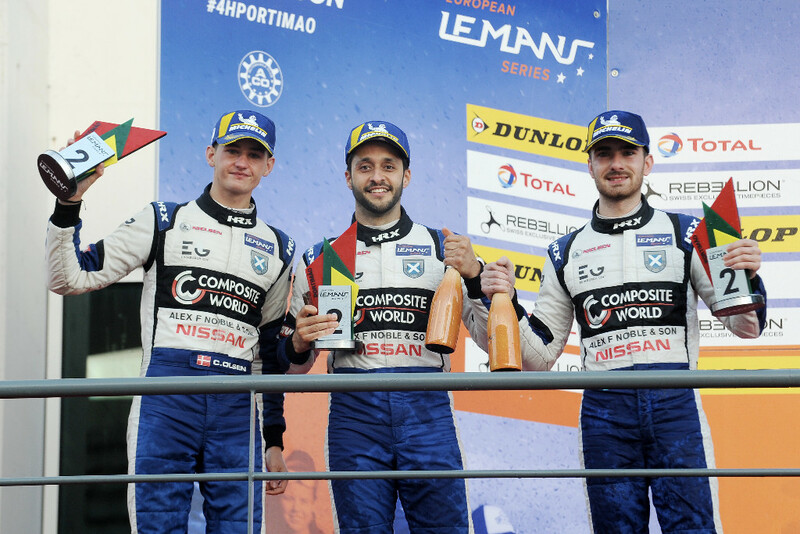 Ecurie Ecosse / Nielsen Racing enjoyed more success racing in Europe this weekend at the Algarve International Circuit, scoring a stunning double podium in this morning’s Le Mans Cup finale, and a second place finish in the European Le Mans Series’ final race during the afternoon. In the Le Mans Cup, Colin Noble and Alasdair McCaig’s John Clark Motor Group and Edinburgh Gin-backed #79 Ligier JS P3 won the race, finishing ahead of the team’s #2 of Tony Wells and James Littlejohn which took third. The result, which marked two wins in a row for the #79 and two double podiums on the bounce, also secured the team second and third in the Le Mans Cup standings for the #79 and #2 respectively. It was a thrilling encounter to bring the team’s campaign to a close. Wells started the race from pole, with McCaig in third. The pair stayed out of trouble early in the race, and managed to retain strong positions, despite having to defend from and keep pace with multiple pro drivers who who were in for the first stint. By the time the pair pitted, they sat seventh and eighth, with Wells and McCaig running nose-to-tail after spending much of the stint battling each other. McCaig’s ability to extract the performance out of the car he did during the first half of the race was notable, the Scot heading into the meeting without any testing at the circuit before the event. Noble then climbed in the #79 for the second half of the race, and had already gained a place during the stops, before quickly getting past Littlejohn in the #2 on track to take sixth. From there the chase was on for the final 55 minutes. The two cars were over a minute off the leaders but gaining fast. Noble and Littlejohn had to make multiple daring moves through traffic and for position to get into podium contention, and did so, with half an hour left. With timing winding down, they managed to climb to third and fourth, from fourth and fifth, in a single lap. That then became second and third shortly after, when the car ahead was handed a stop-go penalty, prompting the duo to push for a 1-2 finish in the final dash to the flag. It didn’t take long for the team to take control of the race. Noble muscled past the leader on the entry to the Torre Vip hairpin up the inside with 11 minutes remaining, leaving the door open for Littlejohn to follow him through on the exit to take second. But, it wasn’t over there, as the two cars behind Noble and Littlejohn were gaining,and made it a four-way battle for the lead in the final two laps, the #2 falling to third on the final tour of the circuit as the quartet fought through traffic. Noble, despite struggling with tyre wear was able to hold on and score his second win in as many races though, and take the Vice-Champion honours for himself and McCaig. The team then bookended the day, and the European season on a high, its #7 Ligier JS P3 finishing second in the LMP3 class after a dramatic four hours of racing at the Algarve International Circuit. The car, driven one final time this year by Christian Olsen, Colin Noble and Alex Kapadia, started the race eighth with Kapadia at the wheel. He remained cautious at the start, and was boxed in mid-pack, dropping to 10th. That only motivated him more though, as he pushed hard to climb the order in the opening hour of the race. By the time the team brought the car in for the first stop, and driver change, Kapadia had risen to fourth place in the class. That meant Olsen’s task was more to maintain the team’s strong position and give Noble a chance at gunning for the win in the final stint of the race with fresh tyres. Olsen, despite having very limited running all week on his first trip to the circuit, was able to keep pace with those around him and keep the team within striking distance. However, his time in the cockpit was hampered by an incident, the Dane hit hard by an out of control LMP2 car, which damaged the left-hand side of the car, the floor and turned his mirror round. This meant Olsen had to deal with a damaged car, and low visibility for the second half of his stint before Noble climbed aboard. Rapid work from the team saw fixes for some of the damage at routine stops, but ultimately for Noble’s run to the flag it was still suffering from lower top speeds and a lack of downforce in the faster corners. Unfortunately, due to the car’s damage, the young Scotsman, who emerged from the final pit cycle second, was unable to reel in the leading car, and therefore focused on scoring the team its third podium of the season and third in the championship standings. While the team’s European season has now come to a close, two of its Ligiers are about to be shipped out to Asia for the start of the 2018/19 Asian Le Mans Series season next month in Shanghai. Colin Noble: “The Le Mans Cup race was such good fun for us. In my stint towards the end of the race I had info from the pit radio telling me what the gaps where, which meant that once I got to the front I was able to manage the race and deal with the flat spot I had which really compromised my pace. I knew I had pace, it was just a matter of not pushing too hard, taking it slow where I knew I wasn’t going to get past. Christian Olsen: “It’s been a real learning year, with such a steep learning curve and I feel like a different driver now looking back. This race was really tough, especially as I had so little track time. I basically went Friday and Saturday with no time in the car at all, so to get myself prepared to go full speed during the race was difficult. But it’s part of the strategy, and had the car not been damaged we may well have won that.